A Manager’s Way to Pride, Trust and Community | UC Berkeley Student Affairs Community Blog! 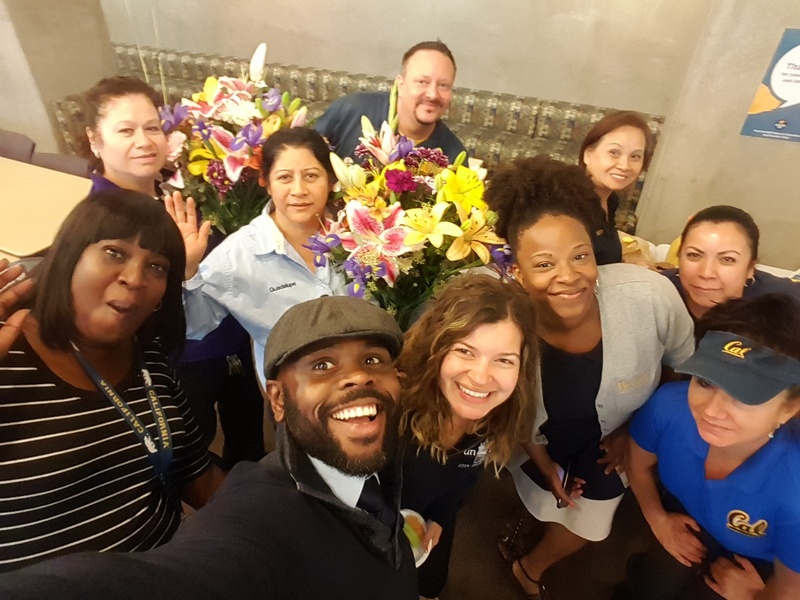 Last month, we shared lessons learned from Adela Rodriguez, RSSP Custodial Supervisor at Unit 1 on how she models the way to Trust, Pride, and Community. This month, we would like to feature another shining example in the Division of Student Affairs, Norton Mitchell, RSSP Operations Manager for Unit 1, Channing-Bowditch, and Ida-Jackson House Apts. He was nominated as a “Culture Star” by 3 GO BIG staff team members, Marney Randle, Kun Yang and Lance Page. Always with a big smile on his face, Norton goes above and beyond to help students and staff at his job everyday. Be responsible for the information you give to staff, but be honest. At Community Conversation 1, CEO from Great Place to Work, Michael Bush, said that we are all adults who can handle difficult situations, so be honest with us. This really touched Norton’s heart. “Let people know the decision or change is in the best interest of the University and they will understand.”, said Norton. As a supervisor, he is honest and real to his staff. He gives them context, not just a piece of information and communicates with them constantly to the best of his knowledge. Norton believes that a little “Thank You” goes a long way. He is always sharing his appreciation with his staff. If you care about others, they will care about you. Build relationships and start conversations. Community is important to everyone. It is all about building relationships and getting the conversations started. “I am not the only one thinking here.”, said Norton. He always presents his ideas to his staff and asks for their opinions. When his staff need help, Norton does in moment coaching instead of waiting until performance evaluation time. He believes in helping his staff in need and propelling them to success. This is Norton Mitchell, who is proud of his work, trusts his staff, and creates a sense of community in his workplace. Norton and his team provide each student with an excellent experience at Cal. Thank you, Norton for being a “Culture Star” and a shining example for your colleagues at Student Affairs. Way to go, Norton!! Nice photo, too!